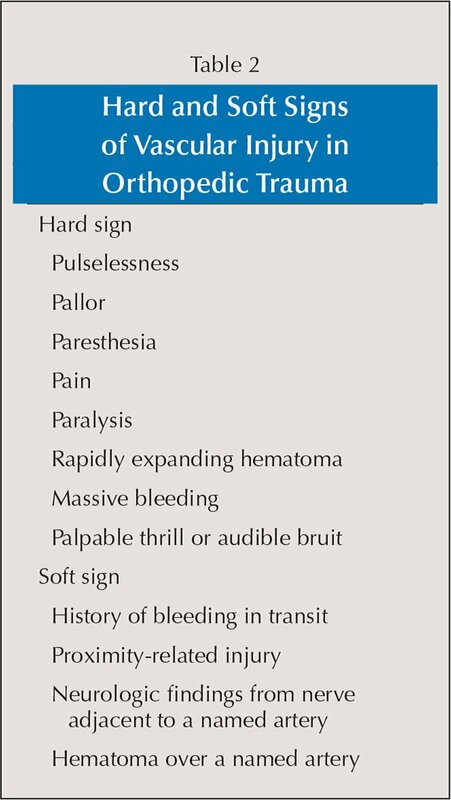 Vascular injury associated with orthopedic trauma is a potentially limb- and life-threatening event that represents a challenge for every orthopedic surgeon and clinician involved in the primary care of trauma patients. Whether encountered in the emergency department or in the elective setting, loss of limb or life can easily occur if the diagnosis of an associated vascular injury is missed or delayed. Under these circumstances, a rapid and accurate diagnosis, as well as a thorough understanding of the management priorities implicated is of paramount importance for successful salvage of the limb. The overall incidence of vascular injury following extremity trauma varies widely by population (military vs civilian), geographic location (urban vs rural), and mechanism of injury (penetrating vs blunt trauma).32,33 In a recent National Trauma Data Bank analysis, the incidence for vascular injury in orthopedic trauma was 1.6% for adults and 0.6% for pediatric patients,34 which is significantly lower than the 6% to 12% incidence among combat casualties.35 Patients with extremity vascular injuries tend to be younger (average age, 30 years) and predominantly (70%–90%) male,36,37even though this trend tends to change to elderly patients.38 In the austere environment, high-caliber rounds and explosive ordinance with shrapnel are the predominant wounding agents.35,39 The force, trajectory, and tissue damage associated with military injuries are much more devastating than those seen in civilian series. The anatomy of the lower extremity predisposes the femoral and popliteal vessels to injury at certain locations during trauma. The popliteal artery runs through the popliteal fossa and is tethered proximally by the adductor hiatus and distally by the soleus arch. Therefore, high rates of vascular injuries are observed with specific lower-extremity injuries such as high-energy tibial plateau fractures (especially Schatzker types IV and VI fractures), high-energy displaced distal femoral fractures at the level of the adductor hiatus, open fractures of the femur, segmental femoral fractures, floating knee injuries, and posterior knee dislocations (Table 1).51 When observing any of these injury patterns, it is necessary to rapidly begin an evaluation for vascular compromise.51 The association between certain elective and emergency orthopedic operative procedures and arterial injuries also has been well documented. Local expertise usually dictates the imaging study to be selected to demonstrate the presence of a suspected vascular injury in the setting of orthopedic trauma. Angiography, CTA, and DUS are the modalities used for this purpose in most trauma centers. Sagittal computed tomography scan with 3-dimensional reconstruction showing contusion of the left popliteal artery in a 50-year-old woman with an open supracondylar femoral fracture. The pulse returned after reduction of the fracture. Incisions typically are made longitudinally, directly over the target vessel proximal and distal to the injury to ensure adequate exposure for proximal and distal vascular control and repair.75 Incisions should provide comfortable exposure. After vascular control is achieved, the incisions can be extended as needed to expose the zone of vascular injury. When the area of injury is in proximity to a joint, a gently curved (lazy “S”) incision to prevent a postoperative scar contracture is recommended.55,75,88 Not dissecting far enough proximally and distally from an area of injury is a common error. However, if control of hemorrhage cannot be obtained or an extensive hematoma is overlying the arterial injury, making it difficult to obtain control close enough to avoid backbleeding from collaterals, it is not inappropriate to enter the zone of injury directly.55,75 After vascular control is obtained in either classic or direct fashion, vascular occlusion can be maintained by applying a small DeBakey clamp, bulldog clamp, or Silastic (Dow Corning Corporation, Auburn, Michigan) vessel loops. Preoperative photograph showing an intima tear of the right posterior tibial artery in a 52-year-old man with a gunshot open tibial fracture (A). 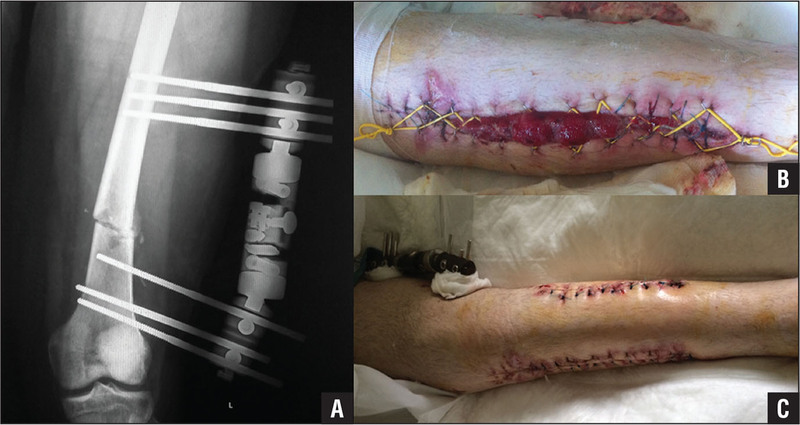 Intraoperative photograph showing surgical repair and fasciotomies performed through the posterior approach to the leg (B). Preoperative photograph (A) and anteroposterior radiograph (B) of the ankle joint showing an open fracture-dislocation of the midtarsal (Chopart) joint of the right foot in a 35-year-old man. 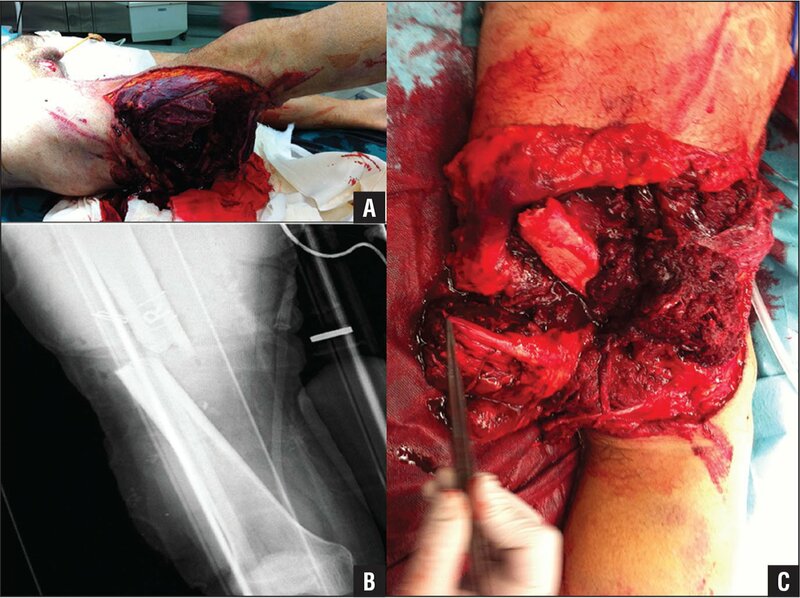 Surgical exploration after reduction and stabilization of the fracture-dislocation with external fixation showed transection of the posterior tibial artery that was repaired with end-to-end anastomosis. Photograph showing the foot 10 days after closure with a split-thickness skin graft (C). Intraoperative photograph showing transection of the right brachial artery in a 6-year-old boy with a humeral diaphysis fracture; the arrows indicate the proximal and distal parts of the artery (A). Intraoperative photograph showing successful reconstruction of the brachial artery with a reversed saphenous vein bypass graft (arrows) (B). Performance of a fasciotomy is most strongly predicted by the presence of a fracture or dislocation, a vein or nerve injury, or multiple arterial injuries.97 Early calf or forearm fasciotomy should be considered in all patients with restoration of distal perfusion after ischemia resulting from trauma, especially if multiple fractures or arterial injuries are present. Although fasciotomies complicate wound management and may require additional operative procedures for wound closure (Figure 5), their benefits, even when performed prophylactically, outweigh these risks. 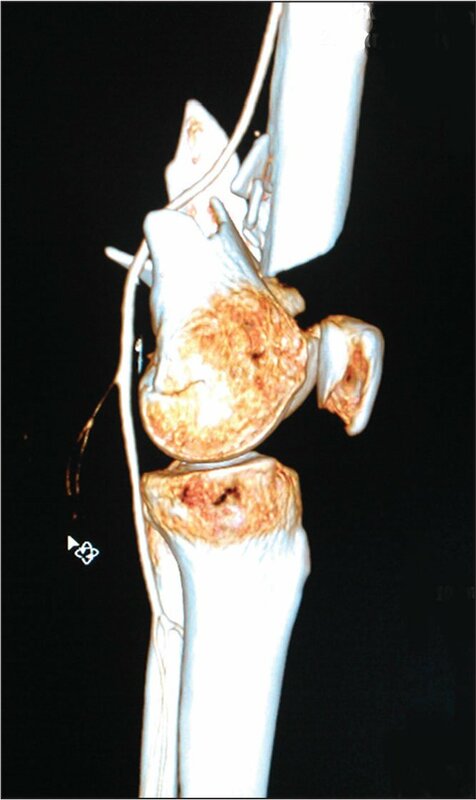 A 20-year-old man presented with a distal femoral diaphysis fracture with transection of the left popliteal artery and thrombosis of the posterior and anterior tibial veins. Anteroposterior radiograph of the left femur showing reduction and stabilization of the femoral fracture with external fixation, which was followed by arterial thrombectomy and fasciotomies of the leg through a medial and lateral incision to successfully revascularize the limb (A). Postoperative photographs showing the fasciotomy incisions approximated with vessel loops using a shoelace technique at 7 days postoperatively (B) and completely closed with interrupted sutures 15 days later (C). A mangled extremity results from high-energy or crushing trauma that causes combined injuries to arteries, bone, soft tissue, tendons, and nerves that significantly compromise the viability of the limb.52,106,107 The management is challenging; the dilemma is whether to attempt limb salvage or opt for a primary amputation (Figure 6). The Mangled Extremity Severity Score (MESS) has been devised as a treatment decision aid; a score of 7 or more points usually indicates the need for primary amputation.107 Other indications for immediate amputation include: (1) a warm ischemia time of more than 6 hours in the presence of a crush injury that disrupts collaterals, (2) injury of the posterior tibial nerve, (3) associated severe polytrauma, (4) severe ipsilateral foot trauma, (5) anticipated protracted course for soft tissue coverage, and (6) anticipated need for multiple reconstruction procedures.108–110 In general, an attempt at initial limb salvage and early revascularization is recommended, especially when the decision of limb salvage versus primary amputation does not seem clear.106 One should keep in mind that a patient’s life should not be endangered by an injured limb (Figure 7). Photograph (A) and anteroposterior radiograph (B) of the right femur showing an open femoral diaphysis fracture in a 49-year-old man. Intraoperative photograph (C) showing transection of the right femoral vessels and sciatic nerve. A primary amputation was performed. Preoperative anteroposterior radiograph (A) of the right humerus showing an open fracture of the right humeral diaphysis in a 65-year-old man. Surgical exploration after reduction and stabilization of the humeral fracture with external fixation showed complete transection of the axillary artery and the ulnar, median, and radial nerves. The arterial injury was reconstructed with a reverse saphenous vein interposition graft. Postoperative photograph after 2 days (B) showing the graft failed. An amputation was performed. 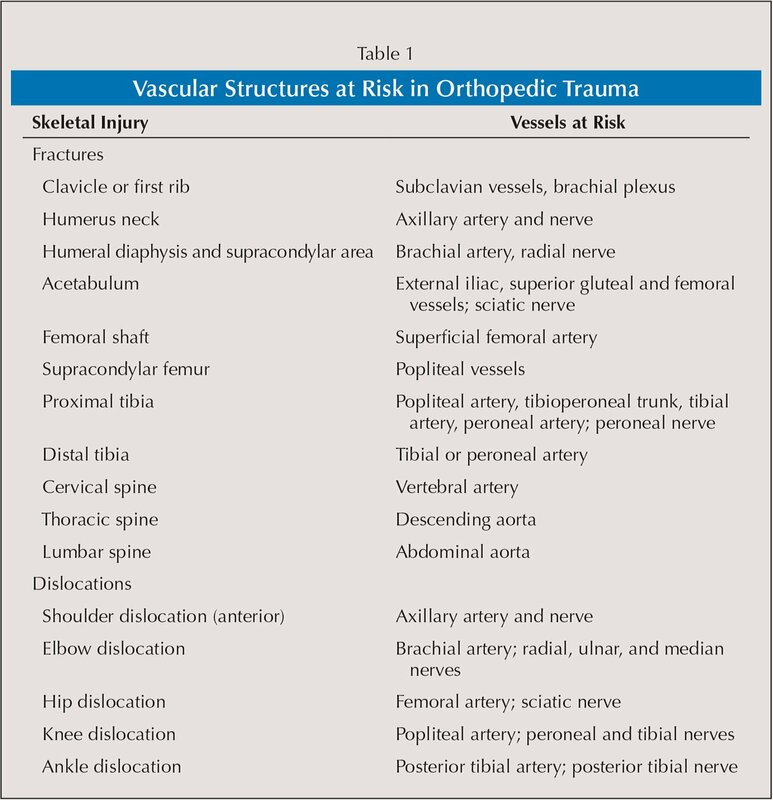 Vascular injury in orthopedic trauma is challenging to manage. The risk to life and limb can be high. Clinical signs can be subtle initially. In the absence of clear signs of vascular compromise, these injuries can easily be missed, with potentially devastating consequences. Therefore, prompt recognition and management of vascular injury in orthopedic trauma is of paramount importance and should be undertaken in an orchestrated fashion with the overall care of the patient. Tertiary trauma centers ideally should have a clear protocol of activation of the appropriate trauma team including vascular, orthopedic, and plastic surgeons; colleagues should establish priorities, discuss the appropriate sequencing, communicate management decisions with the operating room personnel and anesthesiologists, and perform the repairs. Although a cold limb requires urgent surgical exploration, resuscitation and management of associated life-threatening injuries should take priority over any extremity problems. Damage-control resuscitation with early blood transfusion is necessary in patients with hemorrhagic shock. Neurovascular status should be assessed in every injured extremity as a priority; findings should be documented clearly in the medical records as a timed entry. Active bleeding should be controlled in an expedited manner, either by tourniquet or a gloved hand compressing the bleeding site. The time of tourniquet placement should be carefully recorded. Blind clamping or local wound exploration in the trauma bay should be discouraged as potentially detrimental. A deformed, pulseless extremity should be realigned and a dislocation reduced; neurovascular status then should be reassessed as reestablishment of flow is not infrequent. Imaging should include DUS, CTA, or on-table angiography; however, imaging should not delay reperfusion as the injury pattern usually predicts the level of vascular injury in most cases. Reperfusion delay with prolonged warm ischemia (>3–6 hours) leads to irreversible tissue damage, with resulting myoglobinuria and acute renal failure that may be life-threatening. Limb salvage is not always the correct decision; in many cases, primary amputation may be the most reasonable choice. In any case, the patient and relatives should be made aware of the possible risks of surgery, potential for multiple procedures, and possibility of immediate or secondary amputation. Preparation for surgery should include (1) administration of broad-spectrum antibiotics, (2) tetanus toxoid, and (3) a bolus of systemic heparin as well as ensuring the injury is isolated and bleeding is under control. The key factors in successful management are optimal sequence of the repair, adequate exposure and vascular control, debridement of the injured vessel wall to healthy intima, proximal and distal balloon catheter thrombectomy, tension-free end-to-end repair or appropriately sized interposition graft, good soft tissue coverage, stable but expeditious fracture fixation, and adequate fasciotomies. Failure to perform fasciotomies after revascularization of an acutely ischemic limb is the most common cause of preventable limb loss. Incisions for fasciotomies or vascular control should preserve perforating vessels, taking into account the future potential need for fashioning flaps for soft tissue coverage. Finally, a bed in the intensive care unit ideally should be reserved for early postoperative monitoring.